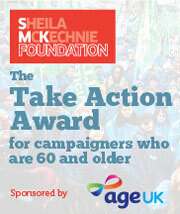 Older people are an often overlooked but vital group of activists so it’s great to see the Sheila McKechnie Foundation launch the ‘Take Action’ award supported by Age UK to ‘recognise and encourage older campaigners who are aged 60 or over who campaign about issues that matter to them’. In my own work, I’ve often been inspired by the commitment that some of our older activists have played in our campaigns, so its great to find an opportunity to acknowledge the key role they play. 1. Engaged – From voting to participation in voluntary groups most surveys show that the over 60s are more likely to get involved, so if we’re looking for people who are likely to get involved on a regular basis older people are likely to be a reliable source. Add to that the fact that they vote means that they’re a group that politicians like to listen to because they’re more likely to turn up at the ballot box when it matters. 2 – Well networked in their communities – Many older people have lived in their communities for years and are often active members of community groups, faith communities, etc. So if we’re looking for people who know other people to get involved in our campaigns using the networks that many have could be an effective way of doing just that. 3 – Professional experience – This is a theme that Duncan Green picked up in a post entitled ‘Are Grey Panthers the next big thing in campaigning?‘ at the end of last year. If we’re looking for people who can talk about the importance of health systems in developing countries, should we be looking to get retired nurses and health workers from the UK involved? Will they be able to speak with an authenticity born from years of working in the health sector that others can’t? 4 – Time rich – One of the criticisms of the current debate about ‘clicktivism’ is that it’s campaigning for the time poor. That it’s suited for people who don’t have the time to do anything more than send an e-mail or click ‘like’ on a Facebook page. Many older campaigners have time to devote to other activities, so perhaps they’re the group we should be focusing on to take part in high-level campaign activities. Build alliances with key gatekeepers – I remember being told once that the government really started to take notice of the Jubilee 2000 Campaign when it started getting messages from local WI groups around the country. I don’t know how true that is, but it’s a useful reminder that coalitions could do well to reach out to and engage similar groups. Profile them in our materials – Too often our annual reports have pictures of enthusiastic young people on a demonstration, perhaps it’s time to start to profile some of the activities of our older campaigners. Remember to go beyond philanthropy – One of the untold stories in development over the last 20+ years has been the role that the Rotary Club International has played in the fight to eradicate Polio worldwide. Through its branches it raised over $900 millions, but more than that it’s advocated to raise over $8billion from governments, but you probably haven’t heard much about it. A great example of using a network, which has its fair share of older members, not simply to raise money but also advocating for change.